WASHINGTON, D.C. (CNNMoney) -- In a rare on-the-record appearance before reporters, Federal Reserve Chairman Ben Bernanke gave a dire warning to lawmakers: Raise the debt limit now. Speaking to a room full of reporters at the National Press Club Thursday, Bernanke said that without an increase in the debt limit, the United States could potentially default on its debt, an outcome he referred to as "catastrophic." "There's only so far that we can kick the can down the road," he said in response to a question about the deficit. 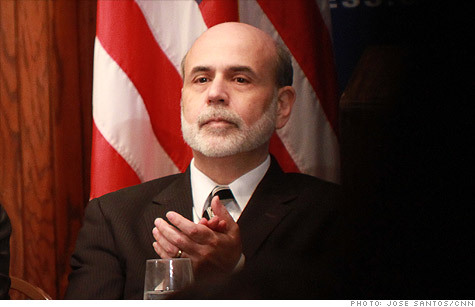 Bernanke's comments echoed ominous remarks by Treasury Secretary Timothy Geithner last month. The Treasury Department said Wednesday, it now expects the United States to surpass its legal borrowing limit of $14.294 trillion between April 5 and May 31. Bernanke also defended the Fed's latest controversial stimulus policies, by offering evidence that the economy is on the mend. He pointed to recent signs of improvement including stronger business and consumer spending. "A wide range of market indicators supports the view that the Federal Reserve's securities purchases have been effective at easing financial conditions," he said in his remarks. Critics of the Federal Reserve have recently railed on Bernanke and his colleagues for continuing a policy known as quantitative easing, which pumps $600 billion into the economy. They say the economy is starting to improve, and easy-money policies will only spur long-term inflation to accelerate. A recent surge in gas and food prices and uprisings in the Middle East, have only made cries from the Fed's critics grow louder. But while Bernanke recognized rising commodity prices, he mostly shrugged off questions about global food and energy inflation as a problem largely confined to the emerging economies and other parts of the world. "Right now, inflation overall -- including food and energy prices -- is quite low in the United States, quite lower than any other industrialized country," he said. The Fed chairman was bluntly honest about the current state of the labor market in his remarks, but his answers to questions about jobs were more optimistic and forward looking. "The sense is that employers are becoming more willing to hire and I think we'll start seeing some stronger payroll reports and some lower unemployment rates pretty soon." But he acknowledged that the recovery is still not at a point that will significantly reduce the unemployment rate, which currently sits at 9.4%. The government's next jobs report is due Friday, and economists surveyed by CNNMoney expect it to show that employers added 149,000 to their payrolls during the month and unemployment ticked up to 9.5%. Bernanke hardly ever takes journalists' questions publicly, so the event was considered a rare opportunity for media to finally get candid answers to their questions about the Fed. When asked about the Fed's communication strategy, Bernanke said he supports a more open relationship with the press. His colleague, Fed Governor Janet Yellen, is currently heading a committee focusing on that topic. "We are looking very seriously at the idea that I would give regular press conferences, in a hope that that would further increase Fed transparency," he said. But Bernanke was more tight-lipped on another subject. When asked about his preference for a Super Bowl champion this weekend, he gave only a hint. "I will be studiously objective," Bernanke said. "Although I do hear one of the teams has a quarterback named Ben."